Below are links to all levels of the flow game green pack. 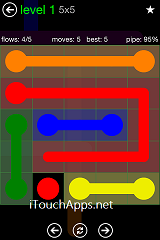 I worked long and hard to find “tidy” solutions that don’t involve making the same pipe looping round and round in the same area of the board just to fill in all the squares. In the screen captures you’ll see that the last remaining square is not filled in. This is to give me time to take the screen capture before the solutions was blocked by the “You completed the level in ? moves ” screen came up.